On December 4 Russian President Vladimir Putin delivered his annual state of the nation address to the Federal Assembly, the both chambers of Russia’s parliament. The state of the nation address is a basic document, which outlines the president’s positions on major directions of the Russian policies not only for the coming year, but also for future. 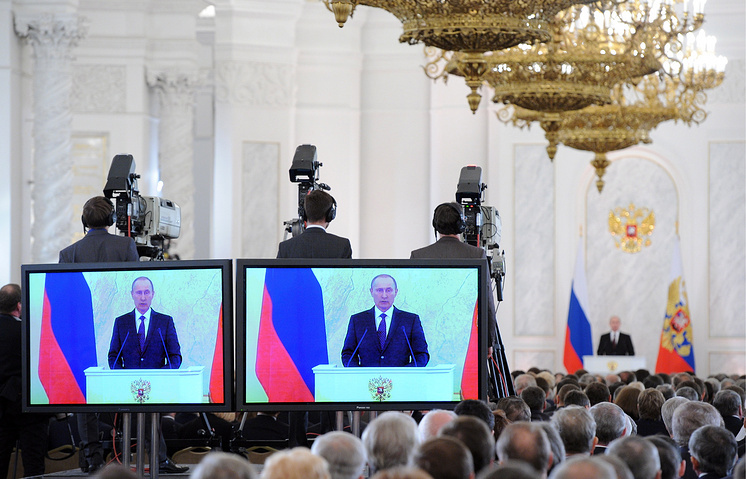 Russia has the right to pursue its sole line of development, the president said. "This applies to Ukraine as well," Putin said. He called hypocritical the use of human's rights issue to cover for the state coup in Ukraine. 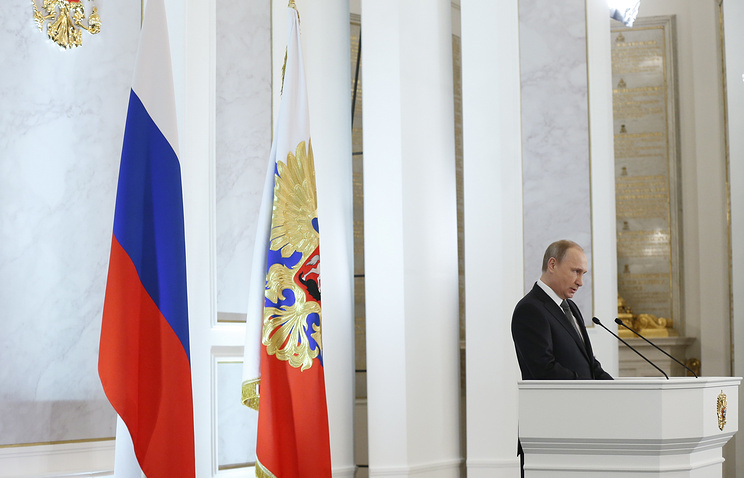 The president recalled the Crimean referendum and the reunification of the republic with Russia. The reunification, he said, is a major historic event. Crimea has significance for Russia, he said, and Russians will handle it that way forever. The United States always influences Russia’s relations with neighbouring states directly or behind-the-scenes, Russian President Vladimir Putin said. Getting back to the way Russia’s dialogue with Europe and the US on Ukraine was developing, the president said “It is not by chance that I have mentioned our American friends, as they have always been influencing our relations with neighbours directly or behind-the-scenes”. “If some European countries have forgotten about their national pride long ago and are considering sovereignty to be a great luxury, real state sovereignty is an absolutely essential condition for Russia’s existence,” Putin said. “The policy of containment was not invented yesterday. It has been carried out against this country for many and many years — always, if one can say. For decades if not centuries,” Putin said. “Each time when someone believes that Russia has become too strong, independent, these tools are used immediately,” the Russian leader said. Russia isn't going to stop relations with Europe or America. Besides, Putin said, Russia has many strategic friends and partners in the world. The country will be open for the world and for attracting investments from abroad for joint projects, the president said. He sets a task of increasing the investment in the Russian economy to 25% of the GDP by 2018. 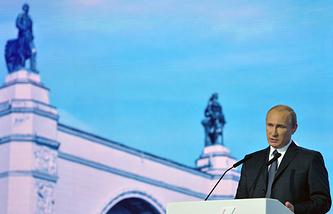 Reasonable import substitution is Russia's strategic goal in the near future, Vladimir Putin said in his address. Russia should get rid of dependency on foreign equipment, including for oil drilling in the Arctic, the president said. According to him, when foreign companies buy equipment abroad, it doesn't do any good for Russia. They should use local products, Putin said. If Rusia buys anything abroad, the products have to be unique. Putin set the task to create conditions fot the SME to take part in the government procurement programs. Since 2002, when the US abandoned the Anti-Ballistic Missile treaty, there's been a threat of strategic disbalance in the world, and it's bad even for the US itself, Vladimir Putin said. "I think this is harmful for the United States as well, because it creates the dangerous illusion of invincibility,” Putin said. He noted Russia isn't going to get involved in the arms race though it will do its best to provide its security. The president added that Russia has nonstandard solutions. It's useless to try talking to Russia from position of strength. "We remember the countries that supported the terrorists in Russia ...and those people make trouble today in Chechnya," Putin said. The terrorists, according to the president, still receive support from abroad. "Those countries want the Yugoslavian scenario to happen in Russia, he said. Putin noted they will fail just as Hitler failed with his misanthropic idea. According to the president, Defense Ministry should create a new system for control of budget spending. Improper spending in the sphere of defense can be considered as a threat to national security, he says. Vladimir Putin says all budget corporations should have a common treasury, and all companies with large state share should reduce their costs several per cent each year. Putin says Russia is capable of modernizing its economy and being leader in the world in certain industries. To achieve that, Russia has to use internal resources, like the Academy of Sciences, and attract Russian nationals from abroad. By 2020 half of Russian colleges should have training cources for 50 most popular professions, says the president. Russian demography programs have proven efficient and the programs will be extended for Crimea, says the president. "The country's population is almost 144 million people, it's 8 million over the UN outlook," says Putin. Russia has life a expectancy of over 71 years and has all chances to increase it to 74, he says. Putin thanks the Russian athletes for their participation in the Sochi Paralympic Games. He says Russia should increase support for the disabled. This, according to the president, includes professional training, production of specific goods, among other things.